I’ve been spending every Monday night at Bradley Classes which is a class that teaches you strategies to have a healthy and natural child birth (i.e. no drugs). One of my favorite things that our instructor has said is that if we like eggs, we should eat two whole eggs (not egg whites) a day. Challenge accepted. I adore eggs. Scrambled, fried, poached, deviled, and especially in egg salad. If you love deviled eggs, then you probably also love egg salad because it’s basically just an easier way to get the same flavor, except you don’t have to fiddle with trying to scoop out the yellows, mix them with mayo and other ingredients, then carefully scoop them back in without breaking the egg whites. 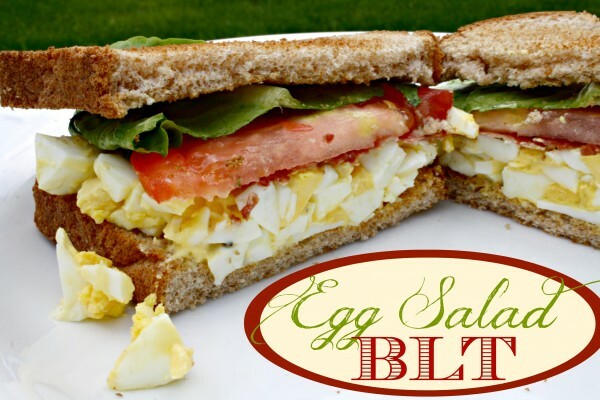 BLT’s have been high on the cravings priority list for quite a while, so I thought combining the two would be delicious and a great way to get some extra protein. Protein is so important during pregnancy and after monitoring my intake last week (for class), I realized that I need to be getting a little more in my diet. 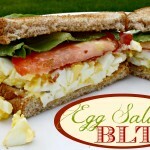 This egg salad BLT is a good start. Two of my favorite sandwiches combined! Place eggs in a small pot and cover with water. Add a tablespoon of vinegar to the water, then bring water to a boil, then lower heat to medium and allow to boil for 6 minutes. Remove eggs from heat and pour water and eggs into a colander in the sink. Turn cold water on and allow to water to run over the eggs for at least 30 seconds to cool them. Peel eggs and place on a cutting board. Chop eggs into chunky pieces and place in a small bowl. 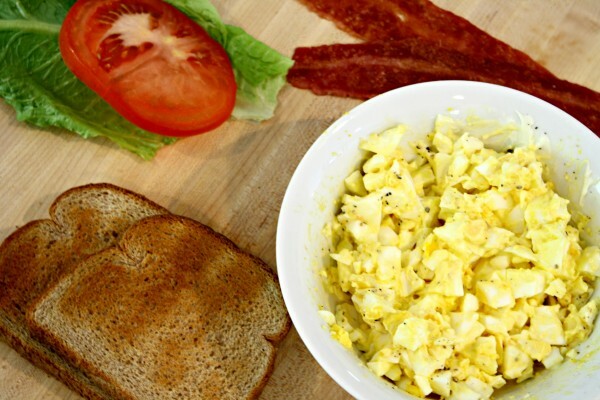 Add mayonnaise, mustard, salt, and pepper to the chopped eggs and stir well to combine. Cook turkey bacon in a frying pan or microwave until crispy. Toast bread. 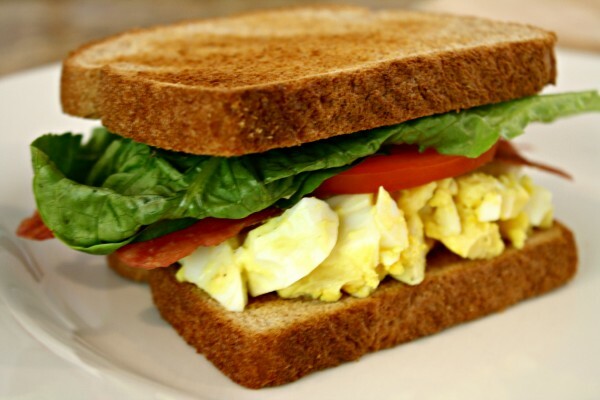 Assemble sandwich by scooping egg salad onto one piece of bread. Top with bacon, tomato, and then lettuce. Top with the remaining piece of bread. P.S. Why does she recommend eating 2 eggs a day? !